I love this time of year! Every day when I come home I make a circuit of the yard to see what's popping up, and where. I play games with myself to see if I can accurately predict what will be next. In general I'm pretty good at it. The tulips caught me off guard though. 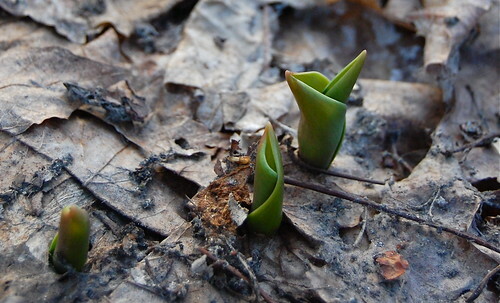 Only three days ago they were under a slab of icy, hard-packed snow. Today they are up over an inch. 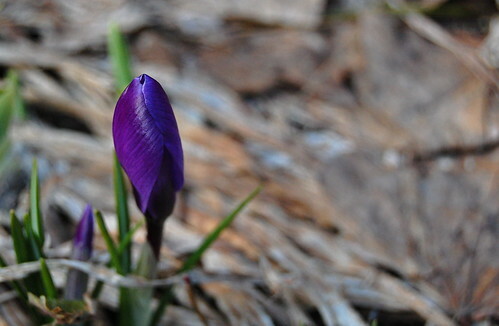 There were half a dozen crocus that were showing some color today, and this purple beauty may even have been open during the day while I was at work. The others probably were not. We're supposed to get another 5-9 inches of snow tonight, so that will end the party for a couple of days. The temps promise to return to the low 40's pretty quickly, so the white stuff won't last too long. We have an urban legend around here that we "always" get a blizzard during the boys basketball tourney. I guess this is right on schedule. i know we're all sick of it, but YAAAAY snow!! A little more drink for the plants and trees to start Spring off right!